*Hardboiled Detective: BENNINGTON P.I. 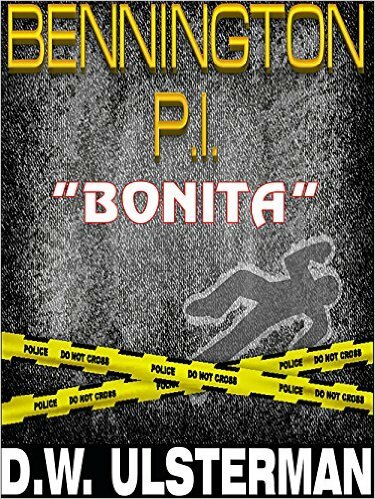 “BONITA”: A thrilling hardboiled detective conspiracy mystery… (Deal, Not Free) by D.W. Ulsterman, Hardboiled Detective. Price: $0.99. Genre: Conspiracy Thriller Deal, Sponsor, Hard-Boiled Mystery, Private Investigators, Propaganda & Political Psychology. Rated: 4 stars on 167 Reviews. 184 pages. ASIN: B00HTWC5G4. Reviewers love it: This story grabs you and flings you headfirst into the center of a conspiracy! Grab a drink and a soft spot, but don’t be surprised if you find yourself holding on for dear life! A masterpiece! Thrilling with a frightening edge of truth! Get this book and be rewarded no matter whether you are a D.W. acolyte or just curious. You’ll be glad you did! ***Crime and Punishment by Fyodor Dostoevsky. Price: Free. Genre: Psychological Thrillers, Classics, Historical. Rated: 4.3 stars on 1352 Reviews. 546 pages. ASIN: B01ACQJ0XE. *Mortal Insight by E. B. James. Price: Free. Genre: Mystery, Psychological Thrillers, Crime Fiction. Rated: 4.8 stars on 6 Reviews. 254 pages. ASIN: B00O40OFLC. *Mr. Standfast by John Buchan. Price: Free. Genre: Spy Thriller, Classics, Historical. Rated: 4.2 stars on 33 Reviews. 142 pages. ASIN: B018S8CI3C. *Run, Girl, Run: A Thriller by Alex C. Franklin. Price: Free. Genre: Suspense Thriller, Sponsor, Thriller, Political Suspense, Murder Mystery, Assassination Thriller. Rated: 5 stars on 2 Reviews. 493 pages. ASIN: B01BUVBJL6. Reviewers: This is a terrific, suspenseful thriller! It kept pulling me back in! The novel is so fast paced and well placed that it is sure to cause you sleep deprivation! A debut Political Thriller that even Stephen King will enjoy reading! *Spurred Ambition (Pinnacle Peak Book 2) by Twist Phelan. Price: Free. Genre: Legal Thriller, Mystery, Suspense, Legal. Rated: 4.5 stars on 4 Reviews. 276 pages. ASIN: B01AV8BEE6. The Hidden Murderess (The Ex Killer Series Book 2) (Repeat) by B.B. Rowell. Price: Free. Genre: Thriller, Serial Killers, Crime Fiction. Rated: 4 stars on 10 Reviews. 196 pages. ASIN: B008MINPHW. Free Terrific Suspense Thriller. Reviewer: A debut Political Thriller that even Stephen King will enjoy reading! Free Terrific International Mystery & Crime Novel! 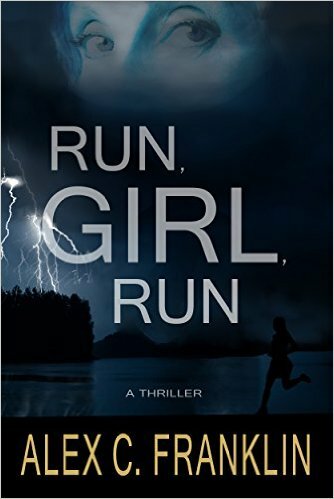 *Run, Girl, Run: A Thriller by Alex C. Franklin. Price: Free. Genre: International Mystery & Crime of the Day, Sponsor, Thriller, Political Suspense, Murder, Assassinations. Rated: 5 stars on 2 Reviews. 493 pages. ASIN: B01BUVBJL6. Reviewers: This is a terrific, suspenseful thriller! It kept pulling me back in! The novel is so fast paced and well placed that it is sure to cause you sleep deprivation! A debut Political Thriller that even Stephen King will enjoy reading! Espionage Thriller Series Special – 2 Books for $1 Each! 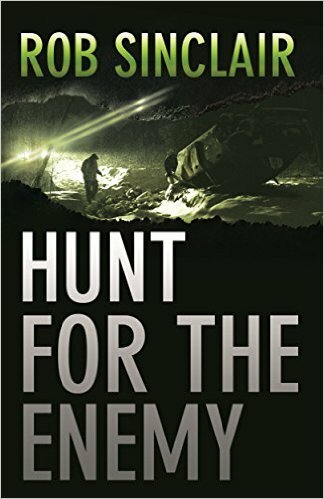 *Hunt for the Enemy: A gripping international suspense thriller (The Enemy Series) (Deal, Not Free) by Rob Sinclair. Price: $0.99. Genre: Espionage Thriller Deal of the Day, Sponsor, International Thriller, Literary Fiction, Contemporary Fiction. Rated: 4.6 stars on 19 Reviews. 338 pages. ASIN: B01B744EV8. Reviewers love it: Sinclair blew all of my expectations out of the water with this book! Buckle up your seat-belt because you are in for a thrill ride! Breathtaking! I told myself, “one more chapter” only to be caught up in the story and another hour passed by! This book would appeal to any adventure fans and can be read as a standalone or as a part of a series. **Rise of the Enemy: A gripping international suspense thriller (The Enemy Series Book 2) (Deal, Not Free) by Rob Sinclair Price: $0.99. Genre: Espionage Thriller Deal of the Day, Sponsor, Action & Adventure, Crime Thriller. Rated: 4.3 stars on 86 Reviews. 340 pages. ASIN: B00TWR9RVK. Reviewers love it: Vividly descriptive! Excellent international intrigue with riveting mystery and suspense! This is yet another spellbinding thriller from Rob Sinclair! Captivating, thrilling and believable! Once again, the author did not disappoint! $1 Action Packed Espionage Thriller Deal! *Hunt for the Enemy: A gripping international suspense thriller (The Enemy Series) (Deal, Not Free) by Rob Sinclair. Price: $0.99. Genre: Espionage Thriller Deal, Sponsor, International Thriller, Literary Fiction, Contemporary Fiction. Rated: 4.6 stars on 19 Reviews. 338 pages. ASIN: B01B744EV8. Reviewers love it: Sinclair blew all of my expectations out of the water with this book! Buckle up your seat-belt because you are in for a thrill ride! Breathtaking! I told myself, “one more chapter” only to be caught up in the story and another hour passed by! This book would appeal to any adventure fans and can be read as a standalone or as a part of a series. Reel Hollywood (Reel Series Book 2) by Jenna Baker. Price: Free. Genre: Mystery, Contemporary Fiction. Rated: 5 stars on 4 Reviews. 273 pages. ASIN: B019JEYNZU. **Rise of the Enemy: A gripping international suspense thriller (The Enemy Series Book 2) (Deal, Not Free) by Rob Sinclair Price: $0.99. Genre: Espionage Thriller Deal, Sponsor, Action & Adventure, Crime Thriller. Rated: 4.3 stars on 86 Reviews. 340 pages. ASIN: B00TWR9RVK. Reviewers love it: Vividly descriptive! Excellent international intrigue with riveting mystery and suspense! This is yet another spellbinding thriller from Rob Sinclair! Captivating, thrilling and believable! Once again, the author did not disappoint! *Patchwork Man: What would you do if your past could kill you? A mystery and suspense thriller. (Patchwork People series Book 1) by D.B. Martin. Price: Free. Genre: Conspiracy Thriller, Sponsor, Mystery, Psychological Thriller, Collections & Anthologies, Legal, Series, Vigilante Justice. Rated: 4.2 stars on 51 Reviews. 253 pages. ASIN: B00M37OUPY. Reviewers love it: This is a beginning of an immensely successful trilogy! A masterful work! D.B. Martin is a talented author and it shows. Gripping, stunning and remarkable! I recommend it to all, and wish I could give it more than 5 stars! *Like Carousels by Nia Hogan. Price: Free. Genre: Thrillers, African American. Rated: 4.9 stars on 10 Reviews. 124 pages. ASIN: B00NLYZXHM. *The Devlin Deception by Jake Devlin, with Bonnie Springs). Price: Free. Genre: Thriller, Political Suspense, Assassinations. Rated: 4.3 stars on 13 Reviews. 383 pages. ASIN: B009XGIFKE. *Patchwork Man (Patchwork People series Book 1) by D.B. Martin. Price: Free. Genre: Psychological Thrillers, Sponsor, Conspiracies, Organized Crime. Rated: 4.2 stars on 56 Reviews. 253 pages. ASIN: B00M37OUPY. As Trees Turned Away by David Kummer. Price: Free. Genre: Psychological Thrillers, Urban, Psychological. Rated: 4.8 stars on 4 Reviews. 208 pages. ASIN: B00X002J9C. *The Generation by Holly Cave. Price: Free. Genre: Technothrillers, Genetic Engineering. Rated: 4 stars on 4 Reviews. 262 pages. ASIN: B00RPOA61W. Editor’s Choice in The Bookseller for March 2015. Shortlisted for the 2015 Mumsnet and Janklow & Nesbit Novel Award. *Mythical (Stone Soldiers #1) (Repeat) by C.E. Martin. Price: Free. Genre: Thrillers, Pulp, Military Science Fiction, Dark Fantasy. Rated: 4.1 stars on 114 Reviews. 320 pages. ASIN: B008913B3U. The Art of Deception by Christine McLean. Price: Free. Genre: Thrillers, suspense Thriller. Rated: 4.4 stars on 8 Reviews. 105 pages. ASIN: B013MZEB9A.